Who are the best guards, wings and big men in the 2016 NBA draft? SI.com ranks the top 15 prospects at each position. Did you think the NBA season ended with the Cavaliers guzzling champagne and J.R. Smith’s tearful post-game press conference? Wrong. The NBA never ends. Nothing ever ends. That’s because the NBA draft is just three days away. Hopes, dreams and questionable suit choices will be everywhere. Fates of franchises and awkward bro-hugs with Adam Silver will hang in the balance at Barclays. Analysts will boldly try to pronounce “Luwawu” and “Poeltl." What that in mind, it's time to break down this year's draft class by positions. You might have heard that the NBA game is an increasingly “positionless" league, which makes this a bit of an archaic exercise. With a nod to the increasingly foggy conceptions of fielding 1–5 on the floor, we’ve broken players down into three categories: guards, wings and big men. In doing this, we factored in players’ size, on-court roles and skillset, while also factoring in collective feedback from NBA front-office personnel. For players who are really between positions, the decisive factor was this: Who can they guard? Because while it matters less if you’re a positional tweener in 2016, it really only matters less if it applies to your offense. If you can’t guard anyone, you’re still a liability. Ben Simmons, for example, is listed as a big, even though he plays on the ball offensively and in college was functionally a guard. This is because right now, the position he’s best suited to guard is power forward, and writing that still feels like an iffy maybe. If he’s out there, he probably has to fill that role on defense. With that said, this is just another way of looking at the class. There are Mock Drafts (link) and Big Boards to better analyze value. Did I mention the Sixers are on the clock? Editor's note: Scouting reports written by Jeremy Woo, David Gardner, Jake Fischer, DeAntae Prince, Jesse Kramer, Eric Single and Avi Creditor. Strengths: Murray was Kentucky’s leading scorer as a freshman and its most reliable regular three-point shooter. Murray played off the ball at Kentucky, and honed his skills at getting open, fighting through picks and shooting over screens. He can drive and score, but his greatest strength in the NBA will be as a pick-and-pop shooter. His height and sturdy frame should be able to handle the rigors of an NBA season. NBA teams will love his devotion to basketball—he has very few hobbies outside of the sport and has only tweeted 36 times since joining the social media network a little more than a year ago. His age gives him an edge too—he has developed very few bad habits that need to be broken, and NBA teams will be able to mold him into a pro that excels in their system. Weaknesses: Because Kentucky had a tremendous pure point guard in Tyler Ulis, Murray received very little playing time at the one. He actually averaged more turnovers (2.3) per game than assists (2.2). In other words, he excels at creating his own offensive but doesn’t make nearly enough plays for his teammates. Teams looking for a point guard or even a combo guard may steer clear of Murray because of those weaknesses in his game. He also can be stiff-footed defensively and looked very raw when compared to Ulis, who effectively and aggressively defended opposing point guards. Strengths: Dunn possesses elite playmaking ability at the point guard spot, combining a knack for passing and impressive court vision to set up his teammates. He harnesses his explosive athleticism to get to the rim and hound opponents on defense. His size and length—Dunn’s wingspan measured at 6’9.5” at the combine—for a point guard also bolsters his defensive profile. All the above combines to create the top point guard prospect in the 2016 draft. Weaknesses: While Dunn’s agility makes him an elite point guard prospect, it also tends to lead him into wild possessions. He averaged a less-than-stellar 3.5 turnovers per game last season. Dunn’s shooting is also erratic. He shot 35.4% from three-point on his 206 attempts, but the conversions came and went in waves. Dunn can tend to be a little erratic and undisciplined on defense. He can also benefit from improving his ability to finish at the rim. ​Strengths: His stats should make this clear, but Hield is an abundantly gifted scorer. He improved from a 23.8% three-point shooter as a freshman at Oklahoma to 45.7% as a senior while attempting 8.7 treys per game. He has drawn some comparisons to Steph Curry—to Hield’s credit, he denies them each time—because of his rapid-fire release and his ability to shoot off balance and at bad angles. He excels in transition and off screens, but he can also dribble himself open. He isn’t as quick or agile as Curry, but he can still get defenders to hesitate and he utilizes a killer fadeaway when they do. His dribble-drive game has improved in lockstep with his jump shot, as defenders can’t give him any space inside half court. He has a team-first attitude and maturity even beyond what you would expect from a four-year senior. Strengths: Korkmaz is a wiry wing scorer with strong athletic traits and lots of room to grow (he’ll turn 19 in July). Although he’s not dunking on people in games regularly, he’s a big-time leaper. Korkmaz has a solid stroke from the outside in addition to some playmaking ability and touch in th elane. He’s been compared to Rudy Fernandez without the attitude. Korkmaz is as toolsy as any two-guard in the draft and makes for a nice upside pick in the mid-first round. Weaknesses: He’s yet to show much against older competition, dominating his age groups for Turkey at youth levels but seeing limited minutes for Efes. That’s understandable, as his body is far from filled out and limits his ability to finish in the paint. A lot of his offense has been centered on his three-point shot as a result. He has yet to show much defensively, where he especially needs more strength and it’s unclear what position he’ll play in the NBA. It was understandably an issue in the EuroLeague, and it’s not going away in the NBA. Strengths: There’s very little Denzel Valentine doesn’t do well on the basketball court. He nearly averaged a triple double last season, en route to AP Player of the Year honors. Valentine has incredible vision and possess a point guard’s playmaking ability in a shooting guard’s body. His skill set is malleable tool chest that can fit many teams’ schemes. A career 40.8% shooter from three-point land, Valentine can provide wing shooting that so many teams desperately crave in today’s NBA. His tremendous length, boasting a 6’10.75 inch wingspan will do wonders as he transitions to defending NBA wings. Weaknesses: Valentine will turn 23 in November, making him a dinosaur by NBA draft standards. His athleticism is a question mark. While Valentine is not lumbering by any means, he certainly is not an explosive athlete. He has the tools to get by, but his athleticism won’t jump off the charters. Valentine, though a tremendous floor general, does have the tendency to force fancy and ill-advised passes in search of highlight assists. While he can make plays out of the pick and roll, he lacks the dribbling ability to score one-on-one off the bounce. He’s also susceptible to getting burned on one-on-one situations defending wings. Continuing to improve his frame will help on that end of the floor. Strengths: Jackson is one of the most explosive athletes in the draft. He boasts a 6’5” wingspan and 43.5” vertical—the fourth-highest ever recorded at the NBA draft combine. He is a natural point guard, but he also has shown an ability to be a combo guard. In 2014–15, he and Jerian Grant effectively split point guard duties between them, and that skill set and selflessness is something that NBA teams value highly. He is lightning quick and relishes opportunities to drive to the rim. On top of that, his best asset is his ballhandling. His small frame keeps his dribbling low and tight and prevents him from coughing up the ball too often. His high assist rate is evidence of his abilities as a distributor. Strengths: Baldwin’s size makes him an enticing defensive weapon. His ability to make up ground quickly with his 6’11” arms makes life brutal on smaller guards. His length also affords him a sweeping stride that he uses to knife to the basket with a purpose in transition. He shot over 40% from three-point range in both of his college seasons and has a good feel for getting himself open looks off the ball. Strengths: Murray is a natural scorer with an impressive handle and ability to get to the basket. His size and length translate extremely well to the NBA game, and while he’s a shoot-first guy at his core, he can make plays off the dribble as well. On raw talent, you can put Murray up there with any guard in the draft, with emphasis on “raw.” He’s an older prospect for his year, turning 20 in September, but there’s a lot of room for development if a team can afford to wait on him. Weaknesses: As aggressive as Murray is, he’s predictably turnover-prone. He’s certainly not tentative. The tools are there, but his defense is very much a work in progress. He’s not an athlete of the highest caliber when it comes to explosiveness and he can be over reliant on shooting floaters. Improving his three–point shooting (28.8%) will be critical to unlocking his full scoring potential. Natural instincts can only get you so far in the NBA—there’s a large adjustment curve ahead. ​Strengths: There’s no better pure passer in this draft—scouts think Tyler Ulis would be the best point guard in this class if were he a few inches taller. Able to slink around the floor with his quickness and ballhandling and score from just about everywhere, Ulis has the requisite skill set to succeed in the NBA as an undersized guard, and teams took notice. He’s an aggressive defender, if not an especially strong one, and his overall understanding of the floor is as strong as any prospect in the class. It’s getting harder and harder to bet against him. Weaknesses: The size factor shouldn’t keep Ulis from being productive, but it may limit his ceiling somewhat and cap how high a team can justify the selection. He weighed in at just 149 pounds at the draft combine, which is a problem when you factor in his height and the demands he’ll face defensively. He will have to figure out how to score against NBA length on a nightly basis. These shortcomings could restrict him to a backup role. Strengths: Beasley pulled off the one-and-done caper that most young players only dream of executing. He did so with efficient scoring and impressive athleticism. Beasley averaged 15.6 points and 5.3 rebounds as a freshman, displaying solid outside shooting and awareness in the open floor. He’s got a high motor and drawn comparisons to Wesley Matthews due to his effort level on the floor. Weaknesses: Because he’s only 19 years, Beasley still has a lot to learn on both ends. Beasley will have to prove he can be a reliable ball handler who can play some point and run a team at times. That means he’ll need to create for himself and others, which was not his strong suit during one year of college. He averaged just 1.5 assists in almost 30 minutes of play at Florida State. Strengths: There’s a premium on 3–and–D players, and McCaw projects nicely. With outstanding length on the perimeter (6’10” wingspan) and quick feet and hands, there is immense defensive potential as McCaw develops. On offense, he can spot up, play in transition and pass the ball comfortably. There’s not a distinct area in which he’s lacking ability, but he’s also not especially far along on his development curve yet. The pieces for a well-rounded contributor are all present. Weaknesses: McCaw is very skinny, which hurts him as a finisher and individual defender. He was known as a shooter in high school, but shot just 36.6% from deep last season. He’s far from NBA-ready right now, and though the talent is substantive, he will likely require plenty of patience. As with any player in that mold, there’s a lot that has to happen for McCaw to become a reliable player. Strengths: With great size and a well–rounded offensive game, LeVert has an enticing package of talent and skill level as a combo guard. He can pass or shoot over smaller defenders and is a good playmaker off the dribble. It’s easy to see a player with his combination of skills thriving in the modern NBA—especially given he was a career 40% three-point shooter at Michigan. Weaknesses: After once being considered a lottery pick, LeVert battled numerous injuries over his college career that hurt his stock over time. The built-in health issues are significant. He’s big, but not overly muscular and can get pushed around as a defender. He doesn’t have one truly elite skill, so you’re drafting on his potential to be very good in a number of areas. He’s a possible home run, but there are no secrets as to the unpredictability here. ​Strengths: Brogdon is a heady player and a tactician on the court. He has an extremely high basketball IQ and limits his mistakes. He was the No. 1 name on every opponent’s scouting report last season, but he managed to have his most efficient year. He is most effective when he comes off screens, and he can duck his head and drive or pull up to shoot in those situations. He improved his three-point shooting in each season, rising from 32.4% as a freshman to 39.1% last year. He’s also nearly automatic from the stripe, shooting 89.7% on free throws. He is a two-time ACC defensive player of the year, and his frame allows him to move effectively through picks and screens and to challenge shots. Strengths: Payton II has all the physical tools you’d want in an NBA guard. He is extremely quick laterally and is an explosive offensive player, developing a reputation in two years at Oregon State as one of the best dunkers in college basketball. Last season, he led the Beavers in minutes, points, rebounds, assists and steals. He has a great feel for positioning on rebounds and should continue to be a possession–extender in that way at the next level. He takes risks defensively—as evidenced by his 2.5 steals per game—but he doesn’t often get burned. He has great recovery speed and excellent instincts for when to be aggressive and when to sit back. He knows how to use his physicality in the lane and is a great finisher around the rim. Strengths: In terms of physicality, Whitehead appears ready to make the NBA leap. He is 6’4” and a strong 210 pounds, and he was in the top–10 of most measurables at the NBA draft combine. His offensive game relies a lot on a quick first step and how physical he can be once he gets into the paint. He already has an elite ability to draw fouls and is a 76.0% free–throw shooter. 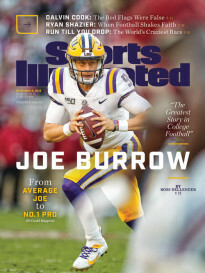 He is an above–average pick–and–roll player, and in a league dominated by the pick–and–roll offense, he could make a quick adjustment. He improved his ballhandling drastically from his freshman year to his sophomore season. On defense, he has great instincts and gives solid effort on each possession. Weaknesses: He struggled with inconsistent play—particularly offensively—last year. It’s unlikely he’ll be reliable for an 82–game NBA season, at least early on. His jump–shooting needs improvement—37.9% from the floor and 36.5% from three—but that hasn’t stopped him from shooting, leading Seton Hall in field–goal attempts by more than 100. His shot selection is suspect, to say the least. 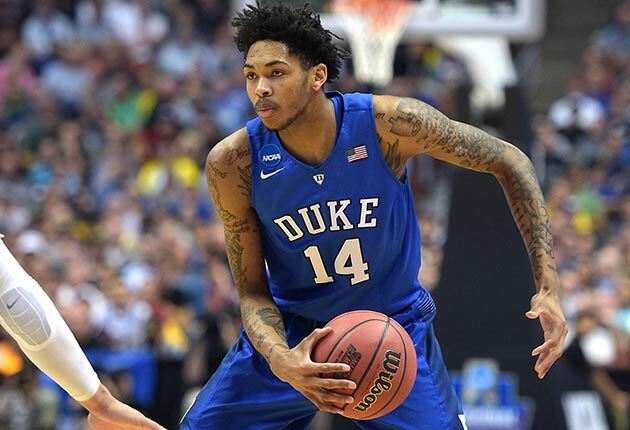 Strengths: Ingram’s skill set points to where the NBA is headed, his shooting and size inspire fever dreams around front offices and suggest a significant ceiling for his production. All 30 teams would love to have a legit 6’9” floor spacer who can create his own shot and handle the ball. He’ll be just 18 years old on draft night, young enough that he could be part of next year’s freshman class, and put together an impressive one-and-done year at Duke, all things considered. “He competes,” one scout says. “You’re going to need that kind of dog [in you] to succeed at our level.” Ingram could eventually play both forward spots and has the type of lanky frame that projects well defensively down the line. He’s oozing with possibility. Weaknesses: Because of Ingram’s shooting ability, there’s some perceived safety in this pick, but it’s probably going to take him a couple seasons to put it all together. Given how young he is, that may not matter to the Sixers or Lakers. Part of that is a largely undeveloped frame—he’s begun to pack on weight, but Ingram’s still a beanpole. “He has freaky length, but i think your concern is who would he actually defend in a game,” another scout said, “and how much strength will he actually be able to put on long term?” His play was at times inconsistent. That said, there are no glaring red flags. Strengths: Brown’s elite athleticism and strong frame provide bankable building blocks for a useful wing player. He doesn’t shy away from contact and scores well in transition. With added commitment, he may have a better chance of reaching his considerable defensive potential thanks to a massive 7’0” wingspan. When he gets moving downhill he’s a load to stop, and did a good job of getting to the line and leveraging his physicality. Brown was asked to shoulder a lot of offense for Cal, and in a simplified role in the NBA—with more space to operate, no less—better days ought to be ahead for him. Weaknesses: After entering the year with plenty of hype, Brown’s lone season at Cal was fraught with inefficient scoring. It ended on a low note as injuries plagued the team and Brown struggled with an increased role in the tournament. According to Synergy Sports data, Brown’s scoring efficiency was average or worse in every offensive situation except for transition play. His jump shot isn’t there yet, nor is his decision making. “He’s not the first freak athlete to come along,” one scout said. “If you don’t match that with understanding of how to play, you can float.” As an even larger adjustment to another level of basketball looms, expectations should be tempered a bit, perhaps. Strengths: Luwawu projects as one of the best two-way wing players in a draft class lacking somewhat in that department. 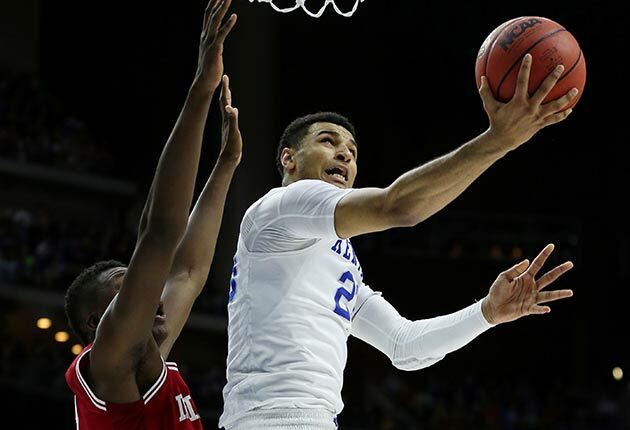 Scouts compare his build and bounciness to a young Paul George or Jimmy Butler. He’s a capable playmaker, has improved as an outside shooter and plays above the rim. “He’s not breaking you down,” one says, “but he gets to his spots.” Another scout cited his strong “in-between game” attacking the basket. Defensively, he should be able to step onto an NBA floor and hold his own early on thanks to his length and quick feet. Weaknesses: Luwawu made major strides as a shooter last season, but will have to show he can continue to hit threes at a passable rate to maximize his offensive output. He’s not a great ballhandler or especially shifty on the drive. He could also improve at finishing around the rim and limiting his turnovers. He brings a well-rounded game, but not a clear-cut elite skill. Exactly how much Mega Leks’s press-heavy system abetted his numbers is up for debate, as well. Strengths: Prince’s combination of length and outside shooting makes him a perfect, modern 3-and-D prospect. He possesses the length NBA scouts are looking for on the wing (6’11.5” wingspan) and was a career 37.6% three-point shooter at Baylor. He rebounds well for his position, and did show an improved passing ability this season, having doubled his assists numbers from his junior campaign. Weaknesses: You cannot ask Prince to create any offense with his ballhandling. At this stage of his career, Prince will primarily be a catch-and-shoot wing, which should benefit both him and his team. Prince often exhibited a poor shot selection at Baylor. He forced a ton of drives into traffic, often trying to outmuscle opponents en route to the rim. And that simply won’t fly in the NBA at all. Prince tended to drift in and out of games throughout his career, especially when Baylor went through long stretches of zone defense. That factor makes it difficult to truly rate him as an individual defender. Strengths: For all the talk about positionless basketball and the advent of more wide-open systems, DeAndre Bembry comes along at the perfect time. He’s a strong ballhandler with a mature, developed game, and may be able to step in and give you some minutes early. He should be able to mesh easily on most teams with his well-rounded skill set. At his size, Bembry can match up with most wing players defensively. He’s a productive, fairly complete player who can do a bit of everything for you. Weaknesses: Bembry’s jump shot is the biggest question about his game. He shot just 26.6% from deep as a junior. He must, at minimum, become a passable spot-up shooter to maximize his potential. For what it’s worth, his three point percentage declined each of his three years in college—his shot isn’t broken, but he’ll need to convince someone he can produce. Bembry’s a great passer and playmaker, but not as great off the dribble. ​Strengths: Hernangomez is a versatile, offense–oriented player who could potentially play both forward spots, though he may not be ready to defend NBA small forwards quite yet. He’s an extremely competitive, high-energy player with deceptive bounce who can play some on the interior and in spot-up situations. He moves well and has a pretty advanced feel for the game—his intangibles are a big selling point. Weaknesses: He’s still a bit rough around the edges and is more of an inside face-up guy than a true perimeter threat. Hernangomez will have to become comfortable off the dribble in all facets to play small forward. Like most his age, his decision making could also be better at times. There’s a lot to like, but there’s also some work to be done. Beyond his consistently strong energy level, he lacks a one true calling card. Strengths: Richardson left school after one season because of two qualities that appeal to NBA teams: his shooting stroke and incredible length. Richardson only shot 35.3% from three-point land as a freshman at Syracuse, but has perfected a gorgeous shooting stroke. He pairs that form with tremendous length for his size and position, owning a 7’0” wingspan. With that size, Richardson should have the tools to guard multiple positions. He’s not only a solid catch–and–shoot player, but Richardson can also attack closeouts off the dribble. At just 20, NBA teams see the foundation for a complete, well-rounded NBA wing. Weaknesses: While Richardson is known as a shooter, his stroke is extremely streaky, as his numbers show. He did not score efficiently from anywhere on the floor, only converting 36.9% of his shots from the field. His defensive ability outside of Syracuse’s 2–3 zone is a very big question. Richardson is not a particularly great athlete—despite his 38” max vertical at the Combine—lacking quickness and explosiveness. He’ll need to prove his ability to defend in on-ball perimeter situations. Strengths: Profiling as a 3-and-D wing, Zipser has a strong build and mature game befitting of his age. He’s an experienced pro, a strong perimeter shooter and good defender who might be able to play some power forward. He’s athletic, attacks the rim and should cut it physically in the NBA. Of this year’s European class, he’s one of the prospects best prepared to step in and play a role. 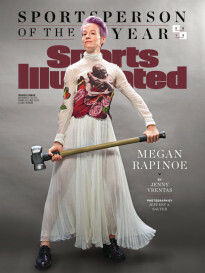 Weaknesses: There are some questions about his overall skill level and that’s tied in with questions about his ceiling. Zipser is a willing role player, which makes it less of a concern, but if he can’t do much off the bounce it certainly limits his output. Though he should be able to defend, if you see him a one-dimensional shooter the appeal is less clear. Strengths: Gbinije played most of his minutes at point guard, a position he has excellent size for. He can stroke it from the outside, as Gbinije drained 38.8% three-point of his three–point tries during his collegiate career. He’s also a good passer and flashed his playmaking ability off during Syracuse’s tourney run and later at the draft combine. Gbinije has a great feel for the game, which will allow him to play multiple positions at the next level. Weaknesses: Gbinije’s biggest flaw is that he enters the draft at the age of 24. He’s already three year’s older than this year’s top point guard prospect, Kris Dunn (22), who is considered an older prospect in his own right. Gbinije shot just 63.9% from the foul line in college, which has created cause for concern amongst some NBA personnel that his outside shooting won’t translate to the NBA arc. He’s not tremendously long and is an average athlete—two elements that could plague him outside of Syracuse’s patented 2–3 zone. Strengths: An athletic wing who can create his own shot and make some plays as a ballhandler, Zagorac is also a capable jump shooter. The diversity of his offensive skills at his size is enticing. He’s backed it up with nice production, and has the right things going for him to become an NBA mismatch. He likes to play in the passing lanes and in transition, and his unique versatility has role player appeal. Weaknesses: Not strong enough to guard the four or quick enough to guard the three, Zagoric may be caught between positions on the defensive end right now. He can move, but isn’t an upper-echelon guy in terms of explosiveness and must become more consistent in all facets. If he’s to function primarily on the ball in the NBA, the adjustment to defenses could be especially steep. Strengths: A springy, athletic slasher, Cordinier’s a young prospect with a strong makeup and explosive bounce. He has decent range as a shooter and a pretty nice feel for the game, all things that point to long–term growth. He could be an athletic, skilled rotational player in time, and has some filling out to do that should help his cause. Weaknesses: He’s never played beyond the French second division and didn’t show a whole lot at the Nike Hoop Summit. Cordinier’s a work in progress without one skill to hang his hat on yet, and doesn’t have the most convincing case as a guy that likely requires years of development. It’s not quite clear what he’ll be, and his stock has been variable the last few months. Strengths: Layman is first and foremost a floor–spacer, but is also an underrated athlete that could possibly play both forward spots. The athletic component of his game coupled with proven ability to shoot the basketball offers some extra upside. If he can parlay it all into becoming a capable NBA defender, there should be a place for him in someone’s rotation. Weaknesses: Although he has the ability to guard multiple positions, Layman was not consistent on that side of the ball in college. His performances were similarly up and down, and he can drift sometimes. He doesn’t have a real offensive sell beyond his jumper just yet, and is limited as a ballhandler and driver. Strengths: Finney-Smith offers the kind of size, versatility and work ethic most teams covet. He is 6’8” with a 7’0” wing span and proved he can defend four positions. Offensively, he can handle the ball well and even played the four in small-ball lineups. He’ll be most effective playing the three in the NBA, and he’ll be an effective defender there. He has a high motor and is not afraid to crash the boards, set screens and or switch positions on defense. He showed improvement in each of his four collegiate seasons. He shot 42.6% and 36.8% from three in his junior and senior seasons, respectively. With practice, he could develop into a much better jump–shooter and become a small–ball stretch four. Strengths: Selden developed into a versatile guard and solid ballhandler over the course of three seasons. With good size and strength, he can defend big guards and even small forwards in a league that continues to downsize. Selden’s been known as a superior athlete throughout his entire career, and that trait put him on NBA radars before ever stepping foot on Kansas’s campus. That praise might have been heaped on him too soon, but Selden showed resilience after a down sophomore season. Weaknesses: Selden was expected to be a one-and-done star in college, but his time with the Jayhawks didn’t go as planned. He came to Kansas with Joel Embiid and Andrew Wiggins, and while his teammates quickly moved on, Selden stayed in Lawrence, as he struggled to develop. Poor decision-making and outside shooting stunted Selden’s growth, and those could still be issues going forward. Strengths: Uthoff brings elite outside shooting to his position. He converted 38.3% of his three-pointers during his three-year career at Iowa and his shooting touch was further confirmed as he shot 79.5% from the stripe. Uthoff possess an overall offensive feel and a unique comfort on the perimeter and at the elbows. His perimeter prowess dates back to his time playing small forward minutes as a redshirt-sophomore in several huge lineups Fran McCaffery experimented with. He also utilizes a solid 6’11½” wingspan to protect the rim. He can hold his ground with terrific footwork in one-on-one post defense as well. Weaknesses: Uthoff is already 23, having celebrated his birthday just after the combine. There’s legitimate reason to believe his skillset is near-close to reaching its peak. It took Uthoff two redshirt seasons before he finally saw the court in college, delaying his journey to the draft. He leaves much to be desired in terms of strength, being an extremely skinny 6’10”. Uthoff’s poor athleticism and quickness will be hurdles to overcome on the defensive end. He’s also not a terrific rebounder, never hauling in more than 6.5 rebounds per game during his three seasons in the Big 10. Strengths: Simmons is a point guard in a power forward’s body. He will immediately be one of the most dangerous and exciting transition players in the NBA. He has the court vision of a veteran one-guard, and he is creative and effective with the way he threads passes to teammates. He can be very selfless in halfcourt offenses, averaging more than five assists per 40 minutes. An ambidextrous dribbler, he is listed as a lefty but often finishes with his right. For his size, he has excellent body control, including a quick first step and an ability to change speeds effectively. Because of his desire to handle the ball in transition, he also has a knack for grabbing defensive rebounds. There’s good reason to believe that he’ll improve as a professional, when he’ll have more talented teammates to pass to and more space to improvise. Weaknesses: Simmons’s most obvious and most discussed weakness is his jump shot. Some pundits have mischaracterized Simmons solely as a bad three-point shooter, but actually he struggled anytime he was away from the rim as a freshman at LSU. He connected on just 32.9% of his two-point jumpers, according to hoop-math.com. His free-throw rate of 67.0% isn’t abysmal for a 6’10” forward, but it is for a player who envisions himself as a point forward. That weakness allowed defenders to slack off him and neutralize some of his strengths as a driver. 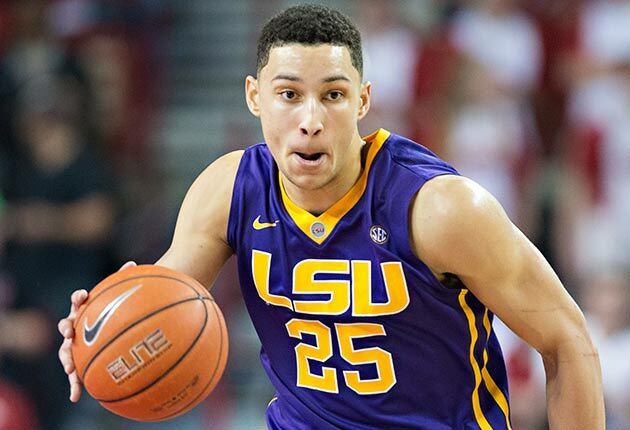 As LSU’s season became more desperate, Simmons’s effort appeared to diminish. Strengths: Bender possesses one of the draft’s most unique skill sets. With oversized playmakers en vogue in a league that’s leaning small, his comfort and fluidity playing on the perimeter as a 7’0” big man gives him fascinating long-term potential. He’s held his own against older competition and dominated against his age group, and those experiences have helped him develop an excellent feel. It’s not totally clear what exactly he’ll be at the next level, but Bender has the tools and profile to be an impact player. Weaknesses: The “tweener” label means less these days, but what does matter is being able to guard a position enough to stay on the floor. Bender’s unusual combination of size and skills make it unclear where he fits defensively. “What position does he play?” one scout asks. “Is he laterally quick enough for the new-age playmaking format? It’s one thing to see guys make plays, it‘s a whole different type of thing on our level.” As his lithe frame develops that should become clearer, but his height is working in his favor. The consistency of Bender’s jump shot will likely determine how much he can use his mismatch on the outside. Strengths: A versatile, offensive-minded big man, Ellenson can put the ball in the basket a number of ways and has potential to shoot the ball from deep (though he made just 28% of his threes at Marquette). With his agility and ability to put the ball on the deck and score, he has lots of mismatch potential at the NBA level. He draws comparisons to Kevin Love and may be more well-rounded offensively at this stage, though not the same type of rebounder or passer. He averaged 20 points per 40 minutes for Marquette, and all in all was one of the country’s best freshmen. His scoring instincts make him an appealing prospect as a modern big man. Weaknesses: The questions here come on the defensive end, with Ellenson’s lateral quickness and foot speed. If he’s going to be a stretch four, he’ll in most cases have to guard a smaller forward and will be asked to switch on the pick and roll. If you put him at center, he’s not the most instinctive shot blocker or rotator. His size (7’2” wingspan, 9’0” standing reach) will help with this, but it’s going to take work to fit him into defensive concepts consistently. Weaknesses: Foul trouble plagued Chriss all season, as he fouled out in 15 of 34 games and registered four fouls in nine more. He’s athletic enough to be an excellent defender, but the discipline isn’t there yet. Those issues extended to the defensive glass, where Chriss grabbed less than three boards per game. He needs to embrace the contact and show he can do some dirty work, because offensively he’s not ready to hang at small forward. Chriss has a lot to prove defensively if he wants to stay on the floor. ​Strengths: Poeltl is the best back-to-the-basket player in this year’s draft. He’s a big who plays well on both ends, scoring in the paint on offense and protecting the rim on defense. He doesn’t have a terrific variety of post moves, but his hands, footwork and athleticism put him in a position to contribute immediately as a mobile post player. Free throws used to be a major weakness, but Poeltl improved tremendously during his sophomore season, jumping from 44.4% to 68.9%. Strengths: Davis’s elite shot–blocking ability— using an impressive 7’2.5 wingspan and top-tier athleticism—has him positioned to be a potential lottery pick. He was able to finish both lobs and dump offs in traffic during his lone year in East Lansing. He’s an especially tantalizing big man thanks to his quick jumping ability. Davis is one of the youngest prospects in the draft, as well. He won’t turn 20 until December. And while he’s just 237 pounds, Davis has the frame and broad shoulders to easily handle another 15 pounds of muscle. Weaknesses: Davis’s biggest weakness may be his voice. The big man is strikingly quiet, and centers must be loud enough as the backline of a defense to direct traffic over 18,000 screaming fans. His offense is limited to the paint, and he’s still extremely raw outside of finishing at the rim. While a terrific rim protector, Davis doesn’t really play team defense and will need improvement on that end. With a game fit more for the center spot, Davis measured just 6’9” without shoes at the combine. • Data Dimes: Which teams have the best, worst lottery pick? Strengths: Sabonis was a productive player at Gonzaga and looks like a good bet to transition well to the NBA. He plays extremely hard and has had success against larger defenders, despite an unimpressive wingspan. His motor, touch and skill level in the post led him to more college success than most predicted. He’s tough, fundamentally strong, very coordinated and has a nice genetic pedigree thanks to his Hall of Fame father. There’s plenty to like, and he just recently turned 20 years old. He’s a guy who you can quickly tell just gets how to play. Weaknesses: He’s not an elite athlete or an especially explosive leaper, and that coupled with his wingspan, raises questions as to how much of his rebounding and interior hustle points will translate. He has defensive potential but isn’t really a shot blocker, so he’ll have to become passable in other areas to stick on the floor. You’re banking on some things translating here to justify a high selection. Strengths: Labissiere could be an ideal modern center, with the ability to hit jumpers, finish at the rim and protect the hoop at an elite level. A lot of this is more conceptual than anything else right now, but he’s a good athlete and a fairly fluid big man. These tools once had him at the top of his high school class, and projected as a potential top–five pick. It takes a little extra squinting, but there’s reason to buy in. When you extrapolate his Kentucky numbers on any per-minute basis, they leave much more room for optimism. ​Strengths: Zizic’s size, rebounding and toughness have intrigued NBA evaluators and suggest he can fill a garbage-man role. He shot 65% from the floor and 72% from the line and was one of the most prolific rebounders in the Adriatic League, which has a recent history of producing bigs. He did all this as a 19-year-old, to boot. His athleticism is solid, and he’s physical enough to have success defensively when he comes over. Zizic has the right type motor to pair with the skills, and for teams with multiple picks makes sense as a stash possibility. Weaknesses: He could use more polish in all areas and will have to adjust to a much more physical, athletic game in the NBA, where bullying people with his size will prove a taller task. Zizic has succeeded with his natural tools and talent, but will have to couple that with new wrinkles as he makes his transition to the next level. Strengths: Diallo has most of the traits you want in an energy big man. He boasts a gigantic 7’4 1/2” wingspan, rebounds well, blocks shots, and most importantly, plays really, really hard. He’s short for his position, but there’s enough working in his favor to suggest he can overcome that. Diallo was all over the floor at the draft combine, getting up and down the court, finding the ball around the basket and hustling the entire time. All these components make up what should eventually be a useful NBA role player. Weaknesses: For all his raw strengths, Diallo is pretty unpolished on offense, without a developed post-up game or mid-range jumper. His scoring will be limited mostly to hustle points and layups off dump passes as a result. His touch isn’t bad, he just needs to be coached. Diallo plays largely off instinct right now, and will need a little extra development time to maximize his returns. After barely playing in college, the jump to pro ball will pose an even greater challenge. Strengths: With prototypical size, a comfortable post game and soft touch, Zubac has established himself in the past year or so as one of the top young big men overseas. His body should fill out nicely, he has great hands and feet, and he moves well on both sides of the ball. Zubac is more of a classic post player and makes for a nice upside pick to keep overseas as he matures. Weaknesses: Zubac is a poor free throw shooter, and his rebounding and defensive instincts have room for improvement. Seasoning against higher-level players will obviously help, as his opportunities have been limited, but that makes for a pretty big uptick in difficulty whenever it happens. He’s probably gotten by more on his considerable natural gifts to this point than anything else. There’s a lot of upside, but he also has a long way to go. Strengths: In theory, Maker is a viable stretch-four, a legit 7-footer with great agility who can block shots, enable defensive switching and be an asset to your team’s coverage. He’s athletic and has potential as a face-up shooter. Maker is also known for his tremendous work ethic, which you can’t say about every five-star high school prospect. If it all pans out, you’ve got an energy big man with a broader-than-usual skill set. Weaknesses: There’s a lot of reason for skepticism here, as well. Even when you get past Maker’s thin build, remember he’s skipping college basketball entirely and never really faced high level competition on a regular basis. It does help that he seems to understand he’s best suited as a role player, but there are safer swings you can take that won’t require several years to pan out. Taking him in the first round could be a tenuous long-term commitment. ​Strengths: Hammons is a legit 7-footer with offensive chops. He improved each season during his four years at Purdue. As a senior, Hammons averaged 15 points, 8.2 rebounds and 2.5 blocks in only 24.6 minutes. He has the skills a man his size needs to exist in a small-ball league, as he can run the floor, contend on the glass and step out for the occasional jumper. Weaknesses: Hammons is 24 years old and has been a relatively known commodity since his first season at Purdue. That means NBA teams have had a long time to pick apart his game. It also means that he could be dangerously close to being a finish product. Hammons also leaves something to be desired in the effort department at times. Weaknesses: Like many bigs in this draft, Zimmerman has a lot of filling out to do, and like many players in this class, period, he’s a project. He has a tendency to shy away from physicality and often prefers to shoot a face-up jumper rather than attack the basket or back people down. He’s going to get pushed around a bit. His right elbow also doesn’t bend all the way after he broke it when he was younger. Strengths: Despite an uneven freshman season, it's clear why Stone has the eye of pro scouts. Just 19, he has all the tools to be a successful pro with plenty of room to grow. Stone boasts soft hands, an array of low-post moves and sound mid-range game to boot. He's a reliable free-throw shooter, decent shot blocker and his overall defense improved as the season went on. He wasn’t a dominant player at Maryland, but he flashed glimpses of his takeover ability, including a 39-point showing against Penn State. Weaknesses: Stone looked overmatched at times in his one-and-done season at Maryland, making you wonder if he deserved to be drafted at all. His game is fairly raw and he must find ways to stay full throttle for an entire game without getting into foul trouble. He averaged a paltry number of assists last year, despite being a gifted passer. And his attitude and temperament serve as giant red flags to prospective teams. Stone comes off as an emotional player and he’s yet to show he can channel it in a productive way.